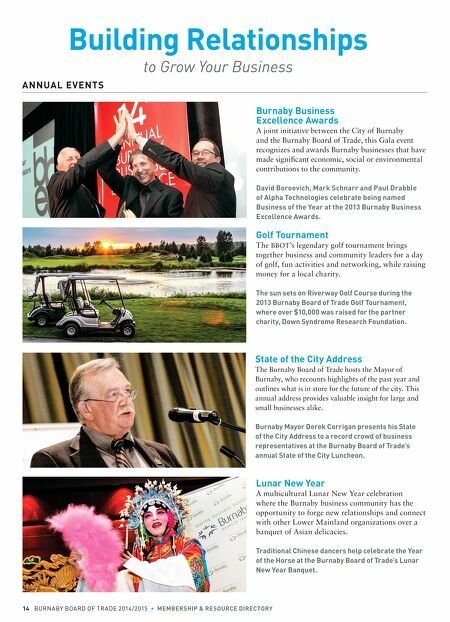 14 BurnaBy Board of Tr ade 2014/2015 • MeMbership & resource Directory Golf tournament The BBOT's legendary golf tournament brings together business and community leaders for a day of golf, fun activities and networking, while raising money for a local charity. the sun sets on riverway Golf course during the 2013 burnaby board of trade Golf tournament, where over $10,000 was raised for the partner charity, Down syndrome research Foundation. building relationships to Grow Your Business burnaby business excellence Awards A joint initiative between the City of Burnaby and the Burnaby Board of Trade, this Gala event recognizes and awards Burnaby businesses that have made significant economic, social or environmental contributions to the community. David boroevich, Mark schnarr and paul Drabble of Alpha technologies celebrate being named business of the year at the 2013 burnaby business excellence Awards. 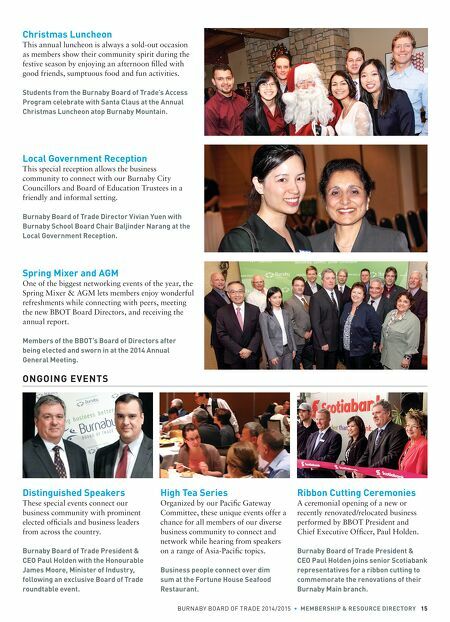 AnnuAl events state of the city Address The Burnaby Board of Trade hosts the Mayor of Burnaby, who recounts highlights of the past year and outlines what is in store for the future of the city. This annual address provides valuable insight for large and small businesses alike. burnaby Mayor Derek corrigan presents his state of the city Address to a record crowd of business representatives at the burnaby board of trade's annual state of the city luncheon. lunar new year A multicultural Lunar New Year celebration where the Burnaby business community has the opportunity to forge new relationships and connect with other Lower Mainland organizations over a banquet of Asian delicacies. traditional chinese dancers help celebrate the year of the horse at the burnaby board of trade's lunar new year banquet.